The people of Bangladesh go to the polls to elect a new parliament and a new government on December 30. The eleventh in the country’s parliamentary history, the polls have, unsurprisingly, generated intense speculation in the country and abroad. From a historical perspective, Bangladeshis have alw­ays been proactive in struggling for democracy or political pluralism. The current campaign for elections needs to be seen against this background. 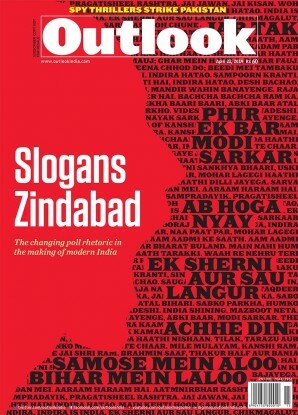 The caveat here is that elections since the birth of the country in Dec­ember 1971, have not been free of controversy. Charges of rigging, coupled with violence by activists of principal parties, have consistently undermined elections. Indeed, Bangladesh is a rare instance of a polity where general elections have, on a number of occasions, been supervised by caretaker administrations in charge between the end of a government’s term and the inauguration of another. The caretaker system drew to an end when the Awami League, led by Sheikh Hasina, rode back to power in polls overseen by a military-backed caretaker government in December 2008. In a significant move, the Awami League government repealed the caretaker provision in the Constitution on the ground that such administrations militated against a smooth functioning of dem­ocracy owing to their unelected nature. The general elections of January 2014, despite the controversy and, in a sense, stigma attached to them (153 out of 300 lawmakers were elected without any opposition to the Jatiyo Sangsad or parliament), were thus held with the incumbent government in power. The opposition demand for elections under a caretaker or elect­ion-time government was rejected. These elections will again be held under the watch of the Awami League government, evidence that all similar demands of the opposition, now largely coalesced around former foreign minister and veteran politician Kamal Hossain, have been binned. 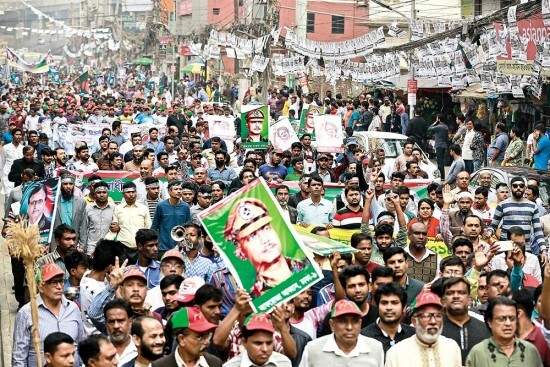 The opp­osition, comprising the BNP of jailed former PM Khaleda Zia, having stayed away from the January 2014 elections, is now on the campaign trail, in what it would like people to believe is a movement for a restoration of democracy. That raises questions about the manner in which the Awami League has governed Bang­ladesh in ten years, since January 2009. Espe­cially since January 2014, the Awami League, in alliance with a few small political parties as partners, has provided fodder to the opposition for criticism. One might as well begin with the current electoral campaign, where opposition leaders and workers have found it hard to organise and hold rallies in the face of attacks by Awami activists. The BNP and the Jatiyo Oikya Front (national unity front), the alliance led by Kamal Hossain, has repeatedly accused the government of not ensuring a level playing field for all parties. The country’s Election Commission, clearly not in a position to enforce the rules necessary for a smooth campaign by all parties, remains the focus of much justified criticism. Public opinion too is apprehensive about a peaceful election process. The campaign has increasingly been confrontational, with the opp­osition accusing the Awami League of trying to rig the vote in its favour and the ruling party warning people of a conspiracy by the opposition to create conditions that could mar the polls. The support for a ministry of minority affairs goes against the secular nature of the state. But Hasina is its one stabilising force. The larger political truth is inescapable: Ban­gla­desh remains stuck between a rock and a hard place. Sections of the electorate fear the high degree of authoritarianism the Awami League could resort to, given its intolerance of dissent in the past five years, once it returns to office. More ominously, there are legitimate concerns about the regression the country will slide into if the BNP and its partners in the Jatiyo Oikya Front win. For all the criticism about human rights violations, disappearances of citizens and repression of the opposition, Hasina’s government has accomplished much in socio-economic areas. The economy is on an upswing, with foreign remittances, agriculture and infrastructure development making good strides. Diplomatically, Bangla­desh under Hasina’s watch has exercised pragmatism in its ties with India and China. Though under huge pressure vis-à-vis the Rohingya issue, Bangladesh has avoided hostility in its ties with Myanmar. While these achievements are being touted by the ruling party, there are serious concerns about the government’s alliance of convenience with the fanatical Hefazat-e-Islam. In recent weeks, the PM and the clerics have declared that they are on the same page, with the government assuring the outfit that nothing will be done to undermine Islam in Bangladesh. A couple of points need to be clarified here. First, the Hefazat is a religious body whose wor­kers in May 2013 spilled all over Dhaka demanding an implementation of its 13-point programme—a hearkening back to medievalism, mostly including rolling back women’s rights. Hasina’s government used security forces to flush out Hefazat activists then. Second, the government has patently acknowledged that an alliance with the Hefazat will guarantee it votes of religious extremists. But doubts rem­­ain if the Hefazat can deliver those votes, given the wide chasm in the partners’ politics and ideologies. It would appear that the government is greatly exercised by the alliance of the BNP and the Jamaat-e-Islami, a defining factor in its alliance with the Hefazat. But the damage that the AL’s sudden fraternising with the Hefazat does to national politics is gravely worrying. The party emerged as the Awami Muslim League in the late 1940s in East Pakistan and shed the term ‘Muslim’ in the mid-1950s to appeal to all Bengalis as a secular nationalist organisation. Led by Sheikh Mujibur Rahman, it led a spirited war of liberation in 1971 and established a secular state. AL’s secular identity has been its principal underpinning. The party’s perspectives have now undergone a change, a recent instance being the assertion by Hasina a few weeks ago that she is supportive of the demand for the setting up of a ministry of minority affairs. That move militates against Bangla­desh’s secular, liberal nature. After the assassinations of Sheikh Mujibur Rahman and other leaders in 1975, the country’s first military ruler, Gen Ziaur Rahman, prised secularism and Bengali nationalism out of the constitution. The second military ruler, Gen Ershad, imposed Islam as the state religion state. It is not likely that Hasina, given her current strategy, will be able to restore the old ideals. But it cannot be gainsaid that she remains the one stabilising force in Bangladesh. She has emerged as the strongest leader in Bangladesh’s history. Her popularity remains higher than any other politician’s. Politically, she is competent and decisive. Despite her firmness or, as some would say, authoritarian streak, Hasina has won the grudging admiration of rivals. All this precludes any challenge to her leadership. The BNP, hobbled both by the incarceration of its leader and the exile of her son on corruption charges, along with its history of bad administration, needs a miracle to win. That possibility looks unlikely. That said, it would be intriguing to observe its policies if and when it does resume power. In simple terms, it would be more of the same. While the party’s India policy has been tempered by a comprehension of ground realities, it has found it hard to shed its pro-Islamic and Pakistan-friendly image. The elections will not be a milestone in Bangladesh’s history. But they promise to be an indicator of where the country goes. If the Awami League returns to power, to what degree can it reassure the country that it will adopt a more liberal, secular position? If the Jatiyo Oikya Front scrapes through, how far can it reassure that it will govern well, or that it will not go for retribution, as it did in 2001, against its political rivals? That, of course, presupposes a necessary leash being put on violence as the country prepares to vote.